I arrived at Private Eye as a token working-class boxwallah – Ingrams’ term of endearment for non-editorial staff – following a mystical experience on Clapham Common (the drugs were better in those days) and a subsequent introduction to Barry Fantoni by the local vicar. My first job was to write up the ledgers for the advertising sales and, such was the shortage of space in the Greek Street premises, I shared a small smoke-shrouded cubicle with Auberon Waugh and Paul Foot. Bron had a habit of throwing his cigarette ends out of the window and on more than one occasion laid waste to a few fancy hats. I spent my first decent wage packet on a camera and the rest of my life trying to use one. Regarding the above photo, Adam Macqueen – who is working on a definitive history of Private Eye – supplies the following which sounds about right. I’d date it circa 1974 as the poster was being used as a prop – rather than the photo being taken to celebrate the poster (if that makes sense). It was from a series of shots I took for a feature in the New York Times. Lighting by Anglepoise. Kagan, who did provide funding for Wilson’s private office, later got a peerage in his resignation honours list – the ‘Lavender List’ – and was imprisoned for theft and false accounting in 1980. 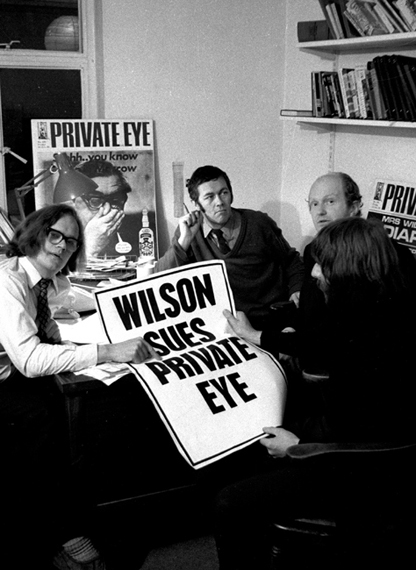 And Wilson continued his feud after his resignation as prime minister in 1976, when he started touting what he called a “Private Eye address book” around friendly journalists. It was presumed to have been compiled from information private detectives working for his friend James Goldsmith had acquired from the magazine’s dustbins during his epic legal battle that year. Soho, 2010. Photo © Mark Granier. My cousin was working in London for a few months, so when I came over from Dublin we met up a couple of times. One evening we went to the ‘Exposed’ exhibition of photography at Tate Modern, concerned with ‘Voyeurism, Surveillance and the Camera.’ They had stretched the theme a little, so that it practically became a history of the art, taking in all kinds of street/reportage/war photography, from the 1930s (or possibly earlier) – Brassaï, Cartier-Bresson, Robert Frank, etc. – right up to contemporaries such as Nan Goldin. Afterwards, we found a little restaurant in her favourite part of the city, Soho. My cousin is a smoker, so we sat at a table on the sidewalk, talking and watching the variegated street-life. 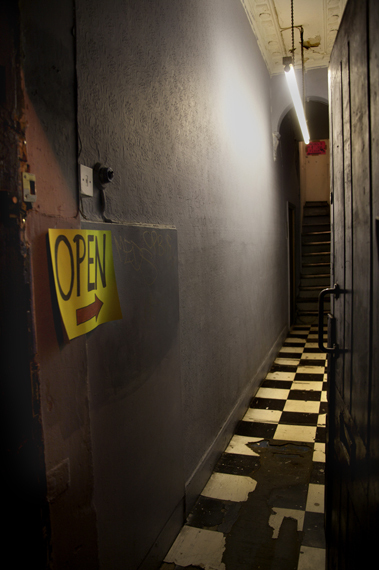 When the place closed we ambled through the surrounding streets. 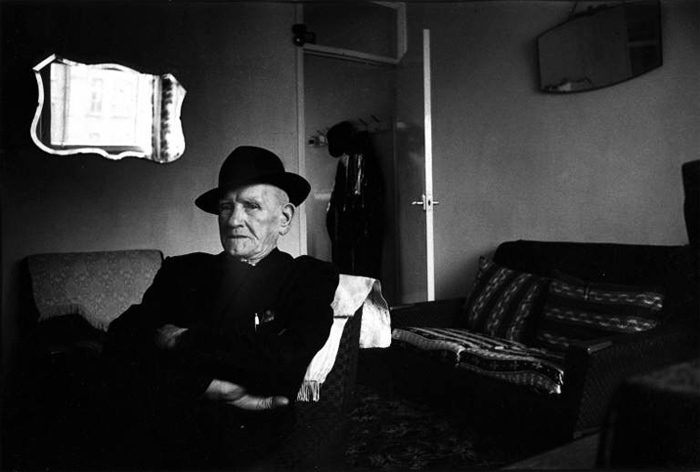 Sebastian Horsely, The French House, Soho, 2002. 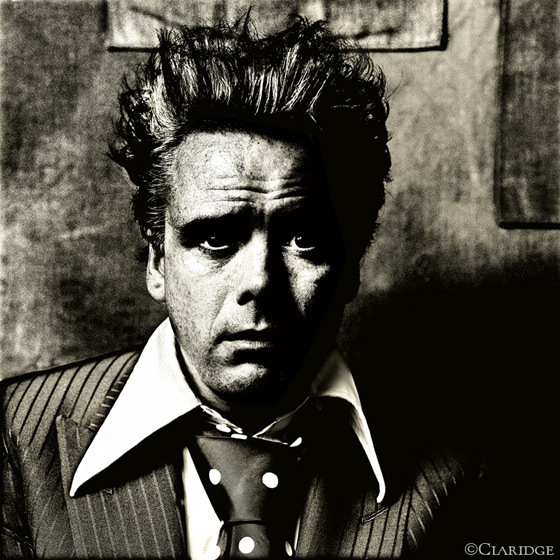 Photo © John Claridge. Clearly God loves ugly people. He makes so many of them. He shows his contempt for life by the kind of person he selects to receive it. Crawling from primeval waters you waddled, slaves, cripples, imbeciles, the simple and the mighty, fighting for the right to breathe oxygen. It was a mistake but you did it. Little did it matter to you that the earth was a vale of tears, of horrid sufferings, of torturous sickness and death. You wanted life little worm. You got it. And what did you do with it when you got it? Celebrate? Have fun? No. You moaned. Equal rights! Equal pay! Equal Equal! Equal is a dead word. No man who says “I am as good as you” believes it. The shark never says it to the sardine, nor the intelligent to the stupid, nor the rich to the poor, nor the beautiful to the plain. The claim to equality is made only by those who feel themselves to be in some way inferior. And inferior they are. With beautiful classical things like me the Lord finished the job. Ordinary ugly people know they’re deficient and they go on looking for the pieces, moaning and complaining. Don’t you realise my darlings that if you have any complaints, they would be theistic : – they should be about your maker , who lets face it, hasn’t done that great a job. What I hate most about ugliness is that it shows such bad judgement. Much as I loathe ugly people our sympathies should not, however, be for them after all. I mean their faces they are behind – they can’t see their revolting selves. We, the public, on the other hand, are in front of them and can see all too clearly. And its simply not good enough. No its not. How dare they look like that? Don’t they realise that their right to look revolting ends where it meets my eye? Gaston’s farewell party, French House, Soho. Photo © John Londei 1989. Gaston Berlemont, and his handlebar moustache, was as much a feature of Soho as the pub he ran. Born in a room above the pub in 1914, Gaston was still at school when he first started serving behind the bar in the evenings. Seventy-five years later the moment had arrived for his final ‘Time Gentlemen, please’. Gaston’s father, Victor – the first foreigner to be granted a full English pub licence in 1914 – took the pub over from a German who, at the outbreak of World War One, feared internment as an enemy alien. It was actually called the ‘York Minister’ but with the arrival of the Berlemonts’, locals nicknamed it ‘The French’, and it wasn’t until 1977 that its name officially changed to ‘The French House’. In earlier days Soho was somewhat of a Gallic enclave with its own French butcher, patisserie, newsagent, cafes, restaurants and two churches. During World War Two the Free French made ‘The French’ their drinking HQ, and it’s thought General De Gaulle wrote his 1940 clarion call speech À tous les Français in an upstairs room at the pub declaring that one day France would be liberated from Nazi occupation. Victor Berlemont died in 1951 and Gaston took over the pub. Under his tenure the pub remained unchanged; the décor remained a sombre brown, and wines, apéritifs, and spirits were the tipples of choice. It must be the only British pub where beer was served in half-pint glasses. And as for buying a packet of crisps, peanuts or pork scratchings, forget it, Gaston refused to stock them. 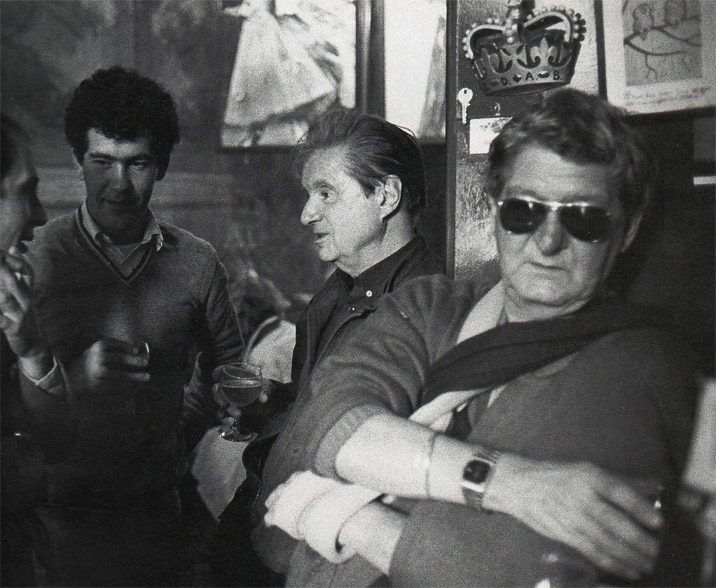 But the unique character of the pub and its eccentric landlord had many luminaries as regulars such as Augustus John, Lucian Freud, Francis Bacon, Dylan Thomas, Brendan Behan, Max Beerbohm, Jeffrey Bernard and Peter O’Toole. Even Edith Piaf and Maurice Chevalier visited the pub. On Friday 14 July 1989, Gaston retired. And of course, being Gaston, he didn’t choose just any old day to go en retraite – he choose Bastille Day, and moreover it was the day marking the storming of the Bastille’s bicentennial. 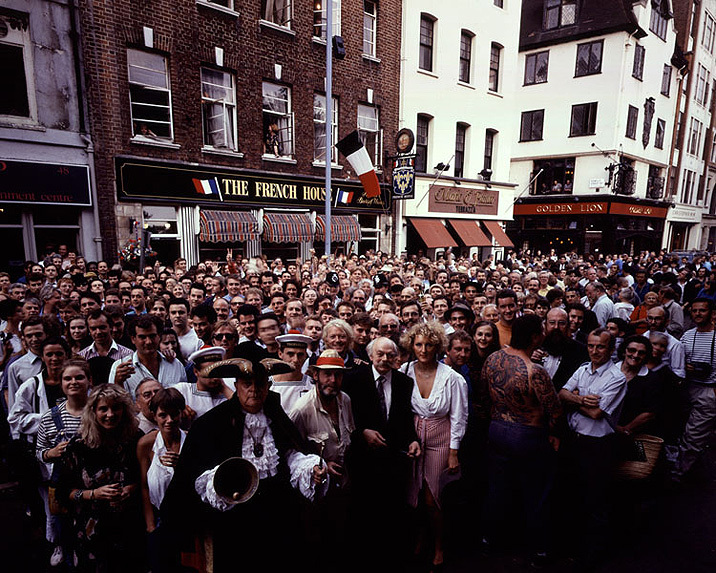 And of course, Soho being Soho wasn’t about to mark the retirement of its longest established patron without throwing a lavish party that resulted in Dean Street being closed to traffic, and the pub having to close twice in order to replenish the stock of booze. An obituary appearing in the Independent newspaper in 1999 reported: Gaston Roger Berlemont, publican: born London 26 April 1914; three times married (one son, two daughters); died London 31 October 1999. … for The London Column. © John Londei 2011. 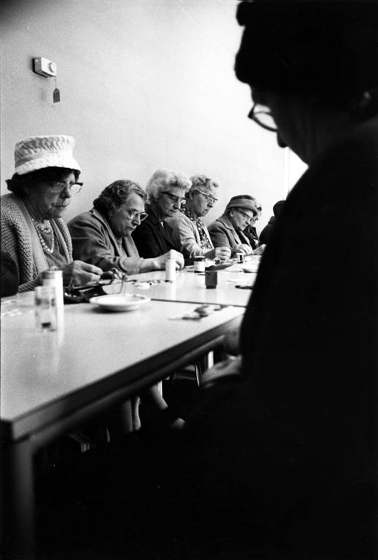 Canteen for the elderly, Pepys Estate, Deptford, 1970. Photo Tony Ray-Jones © RIBA Photographs Library. In 1969 Hubert de Cronin Hastings, owner of the Architectural Press and editor of its leading journal, the Architectural Review, decided to experiment with a new look for the magazine. He accordingly launched the ‘Manplan’ series published in eight themed issues between September 1969 and September 1970. Rather than being illustrated by the Review’s usual staff photographers, Hastings commissioned photographs from some of the leading photojournalists of the day asking them to cast their lenses in judgement on the contemporary state of architecture and town planning. Thus Ian Berry illustrated two issues on communications and health and welfare while his Magnum colleague, Peter Baistow, also supplied the images for two, those on religion and local government. Other contributors were Tom Smith on education; Tim Street-Porter on industry and Tony Ray-Jones on housing. The series kicked off with a typically hard-hitting issue on ‘Frustration’ with photographs by Patrick Ward. These images were totally unlike anything that had been seen in the Review before. Ironically the Review had done much to formulate the norms of mainstream architectural photography with dramatically hagiographic renditions of pristinely new buildings set beneath sunlit skies and photographed with large format cameras. Instead it now offered its readers harsh, grainy, 35mm images of a grimly dystopian world the photographers argued that architects and planners had created. The unrelenting grimness and claustrophobic intensity of the photographs was magnified by the use of wide-angle lenses which had the effect of thrusting the viewer into the frame; by the reproduction of the photographs in a specially devised matt-black ink; and by the provision of hard-hitting captions that sometimes were printed over the images. Not surprisingly the series proved too much for many of the Review’s architect subscribers and in the face of falling circulation figures Hastings was forced to admit defeat and abandon his experiment. Despite being short-lived, ‘Manplan’ can be regarded as the high watermark of photojournalism applied to architectural photography. During the 1960’s this had been pioneered by magazines such as Architectural Design, which in September 1961 had published a special issue on Sheffield illustrated by the great photojournalist Roger Mayne and by photographers such as John Donat (1933-2004) who, much influenced by Mayne’s example, took advantage of the smaller format cameras and faster films then appearing on the market to show how buildings interacted with, and were experienced by, their users and the public. For so long banished from the architectural photographer’s frame, real people going about real tasks, rather than merely included to give a sense of scale, now became the norm. By the 1970s, however, this application of the tenets of photojournalism and street photography to architecture was drawing to a close. There were two main reasons for this. Firstly, owing to the slow speed of large format colour films and the elaborate lighting set-ups they often required, the explosion in colour photography placed a renewed emphasis on architecture’s more formal qualities at the expense of human activity. In addition the increased commissioning of photography by architects themselves rather the more independently-minded magazines inevitably premiated eye-catching imagery that would show architects’ works in the best light. However, it is pleasing to reflect that today ‘Manplan’ has found favour once again as photographers once more seek to deviate from the norms.